The best summer nights include a trip to the pool and some fun together as a family outside in our backyard! 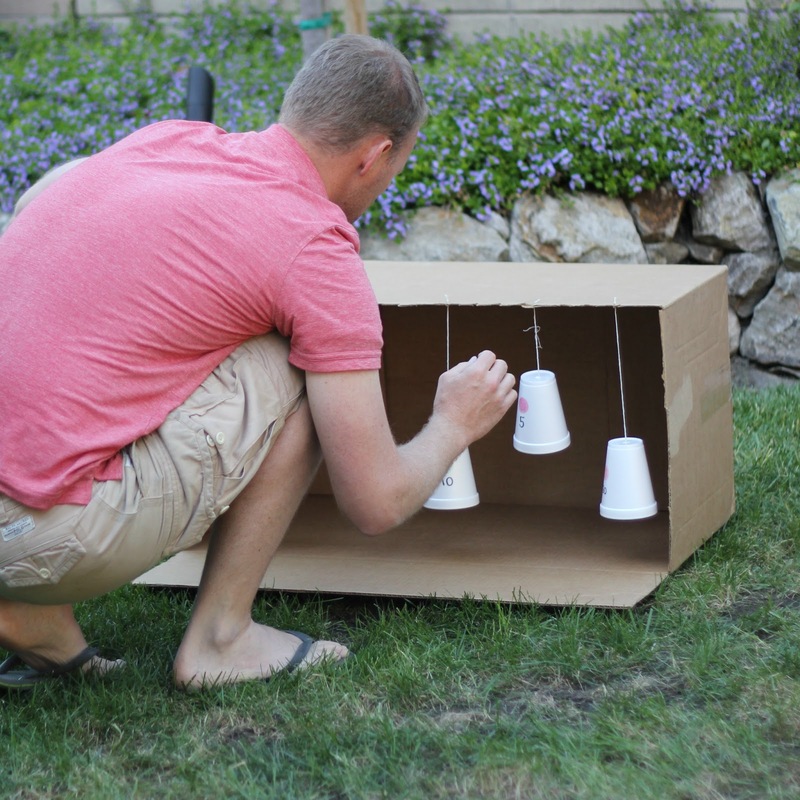 We love to play games and create simple activities that all family members (ages 3, 5, 8 + grown ups) can enjoy. Recently we celebrated Father's Day a bit early with the arrival of some new NERF blasters. To kick off our early Father's Day celebration we got everyone together (including my husband), to make the ultimate NERF play zone in our backyard. This post is sponsored by Duracell. The opinions and text are all mine. Today I'm going to share a bit about the new blasters that NERF recently unveiled to kick off summer. I'm also going to tell you about how we created a fantastically simple NERF family play zone. Before we got started building our play zone, we revealed our new play zone materials... including the NERF N-Strike Modulus ECS-10 Blaster and the NERF N-Strike Elite Stryfe Blaster. Happy early Father's Day to my husband (and the kids)! The kids were pretty overwhelmed with the shear size of the NERF blasters. And they were relieved to see that we'd picked up Duracell batteries at Toys R US so that they could start playing with the blasters right away! Once we loaded up the blasters with Duracell batteries and assembled them, we were ready to start creating our play zone. This blaster was super flexible and has more than 30 combinations It features targeting scope, drop grip and dual-rail barrel. The blaster can launch the included darts at targets up to 90 feet away. We need a bigger backyard for this one!! Ha! The blaster does not include Duracell batteries and requires 4 AA batteries. 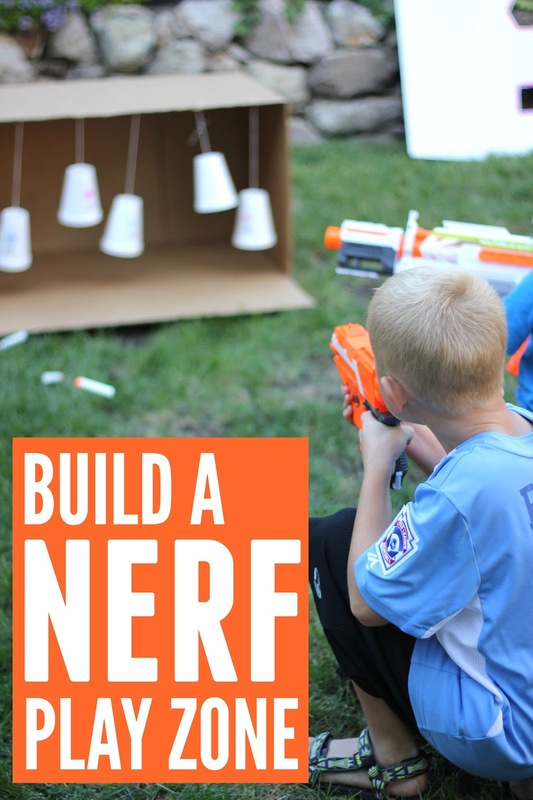 HOW TO CREATE A NERF PLAY ZONE!! Before you can start creating you need to do some brainstorming! 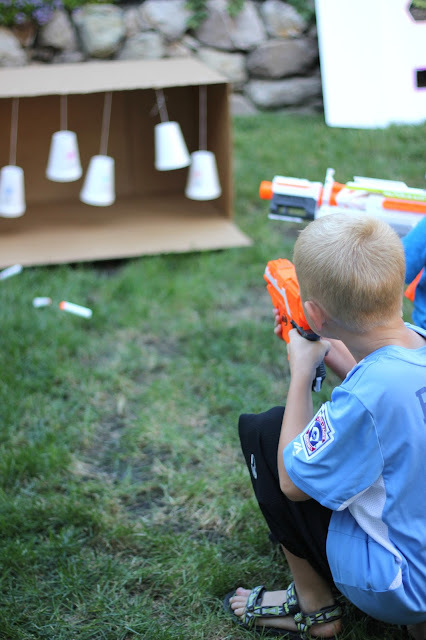 We decided to make some target games to play along with creating a NERF funfield for battling each other. We grabbed some cardboard boxes and tri-fold display boards to set up barriers around our yard to hide behind. We grabbed some whiffle balls and mini clay pots to make little targets to hit. We placed these on a box outside and labeled each pot with a different number of points. When kids hit the balls they earned points for their team! We also created a simple moving color target. You can read the full tutorial in my previous moving moving color target post. It was really easy and just required some cups, string, scissors, markers, and a cardboard box. We used it with a ball and now we are using it with NERF blasters! As part of our play zone we set up colored pool noodles in the yard as a tunnel. We used lawn stakes and then stuck the pool noodles on top of them! The kids designated it the "safe zone" or "base" every once in awhile as well. The large cardboard boxes were probably the favorite play zone materials! My husband and kids worked together to set up our NERF play zone and I loved watching them create and brainstorm together-- especially since it was super windy outside and things kept blowing over!! The wind actually made the play zone more fun because things kept changing. Once everyone loaded up their blasters, darts started flying! There was a lot of giggling, rolling, running, and hiding. After we went through all of the darts we would load up and play again and again. Although the NERF blasters are best suited for kids ages 8+, my 5 and 3 year old had a lot of fun with them! It was hard for them to wait to get blasters reloaded though! When we use blasters with kids we always make sure to go over the rules before we get started. We remind kids not to aim at faces and eyes and we encourage them to hit targets more than people. NERF blaster time is FUN! 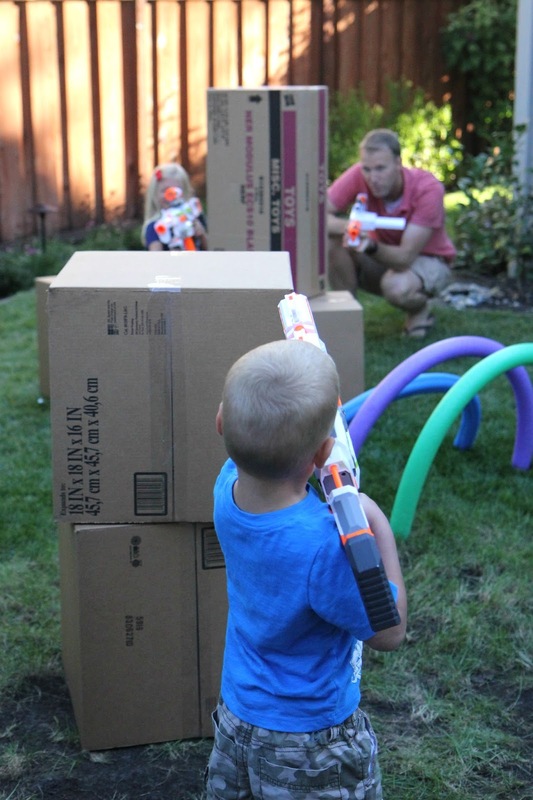 In addition to our little family battle, we tried out some of our NERF play zone games. The kids aimed at the moving target game and tried to see who could hit the most colors and get the most points. They also knocked the whiffle balls off the pots and tried to see who could hit them all from furthest away. After watching my husband and kids play (and joining in too! ), I was reminded that although these NERF blasters are a really great gift for your kid, they are also a fun gift for dads, too. I think we manage to sneak a NERF blaster into a Father's Day gift bag every single year for my husband. During the week of 6/12-6/18 make sure to check the Toys“R”Us circular. You can buy 1 pack of Duracell and get the 2nd 40% off. In addition to the circular offer, select Elite Blasters will be 20% off during the week of the 6/12 – 6/18. Toys R Us and Duracell have generously provided a giveaway of a $75 Toys R Us gift card plus a Duracell Coppertop AA 16 pack of batteries for a Toddler Approved reader! Enter the giveaway below. Giveaway ends at 12:00 a.m. on Friday, July 1, 2016. Giveaway is for USA Residents only. Read more of our Giveaway Rules HERE and enter the Giveaway below using the Rafflecopter! 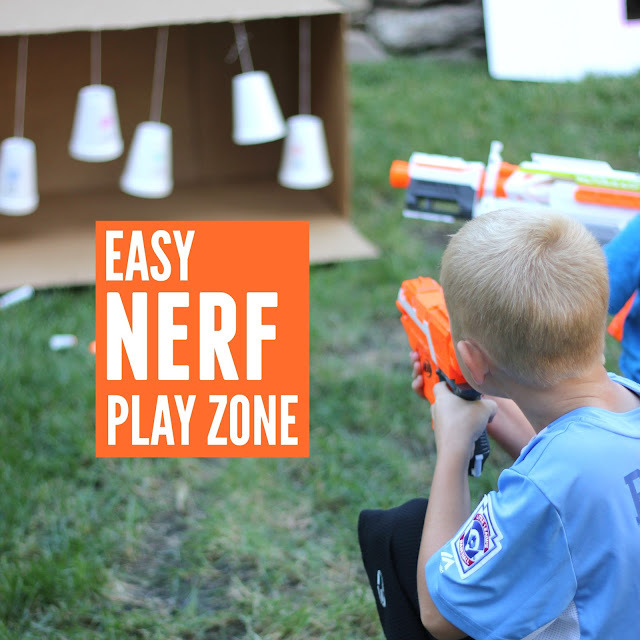 We managed to capture some of our NERF family play zone on video, so come back later this weekend to check out the kids (and my husband) playing.